haha! – I love your y-axis. For a second, I thought this graph was showing a raising rate in pirating. Funny on so many levels. And I can’t believe that you out ‘second-hand contact lenses’ in there! You need to label your X-Axis. I don’t get it. 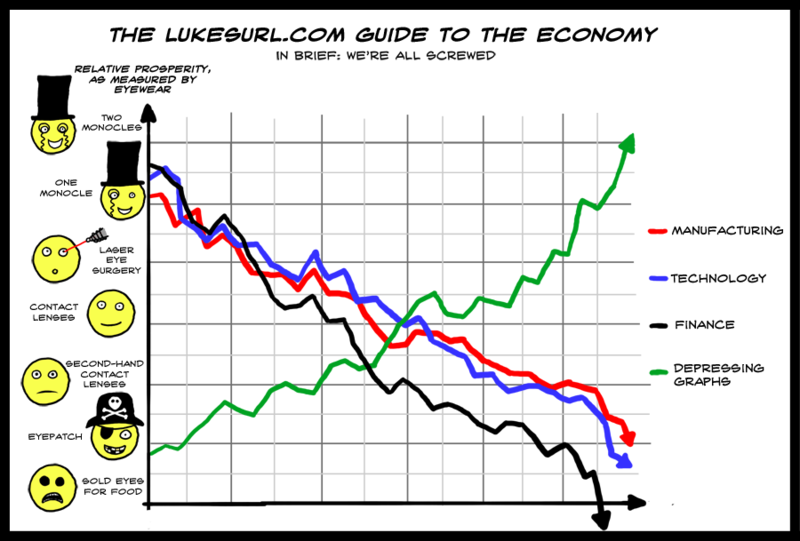 Actually, you should place the ‘relative prosperity’ along the X-axis from double monocle to missing eyes, then put ‘absolute awesomeness of’ along the y-axis. y is everyones economy bad? how does that work? Heh, the ‘depressing graphs’ bit reminds me of a sign business mentioned in the Michael Moore movie, which was able to buck the depr-err, recession, due entirely to all of the foreclosure signs they were making. What is the horizontal axis? Shame on you! Label your axes, young man!